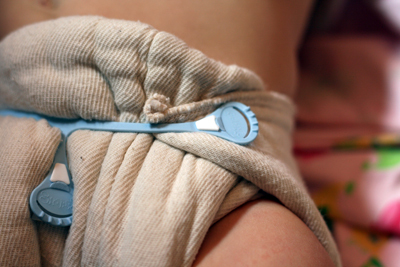 The product I'm reviewing today is one of my favorite items to have ever tried because it broke me into a whole new realm of cloth diapering--using prefolds! When Swaddlebees offered to send me a 6-pack of their cotton prefolds along with a coverall to use, I was both excited and nervous. I have never tried prefolds before. I had never used pins or a Snappi. I wasn't sure if I had the skill to do such things. I had fears about rash, leakage, or staining. I am so excited to report back that after delving into the world of prefolds, I have nothing but love for these simple diapers I'm about to review! 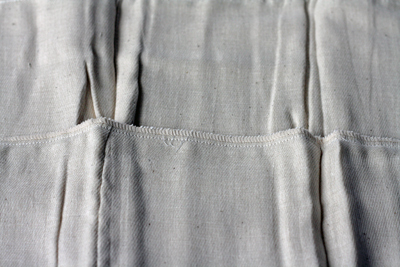 Up for review, Swaddlebees sent me a 6 pack of their natural cotton prefolds in the Medium/Large size (there is also a Newborn/Small size available). They also sent a pair of large coveralls (in the super sweet & girly 'Pink on Chocolate' polka dot print!) to create a truly leakproof system! When I first opened up the pack of prefolds, I was perplexed. I had heard that prefolds were extremely absorbant, but the fabric felt thin and wimpy to me. I recalled the importance of prep-washing and crossed my fingers that some magical tranformation would take place through my repeated cycles of hot washes. And something magical indeed did take place! After a few hot, soapy washes, my prefolds came out super plush! All the fibres bulked up at least tenfold. The fabric was no longer scratchy but was cushy and soft. Now I was beginning to believe in the absorbant properties of these prefolds, but I still had to put them to the test! Not being comfortable with pins, I used a Snappi fastener with my prefolds. The cushy cotton allowed lots of thick layers for the Snappi to grab onto so that there was no fear of the claws going through and digging into Baby Aurelia's tummy. When we began using these prefolds, Aurelia was going through a nasty diaper rash (mostly from teething), so it was real relief to be able to put her in something totally natural and breathable. Around the house, we left the prefolds on coverless to allow for maximum air-flow to help heal her bottom. Even if she wet her diaper during playtime, these prefolds really were thirsty enough to not leak through--only a bit of dampness would begin to spread so that I could tell when she needed to be changed. This dramatically helped me to clear up her rash. These prefolds were also a lifesaver during a heat wave we recently had--again, they were much more comfortable and breathable during the heat and humidity. These prefolds would also be terrific for potty-learning or Elimination Communication as they allow both baby and parent to get a sense for dampness spreading (while still comfortably containing all accidents!). After prep-washing, the prefolds are super plush and absorbant! What really shocked me, though, was just how AMAZING these prefolds perform at nighttime. As Aurelia has grown from a newborn to an infant to a one year old toddler, it's amazing how many changes we've had to make to our nighttime diapering routine! As she'd recently become a tummy- or side-sleeping heavy wetter, pocket diapers (even double stuffed) were just not working well for nighttime anymore. 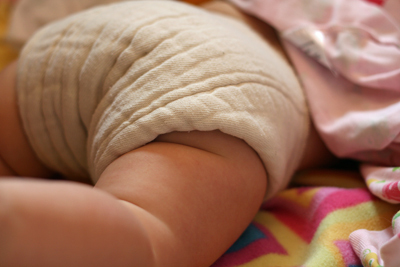 We tried everything and often reached for the disposable diaper at night to ensure dry sheets in the morning. I wanted to give these prefolds a nighttime go but was extremely skeptical that they would work. I fastened them on in a basic newspaper fold (our favorite), added a stay-dry microfleece liner from my own collection just for a little extra wicking power, and I covered the whole shabang with the pink polka dot coveralls that Swaddlebees had sent along. It was amazing! It was miraculous! These prefolds absorb and absorb and absorb and have NEVER, EVER leaked after weeks and weeks of repeated nighttime use! In the morning, the prefold feels like it's about 5lbs heavy when I remove it, but Baby's bum is dry, with no redness. This cover is totally leak-proof with double rows of snaps at the waist, an adjustable rise, and double leg gussets! Laundering out the prefolds is a breeze! Occasionally I'll rinse my night diapers to cut down the ammonia smell in the pail (especially in the summer's heat). However, with or without pre-rinsing, I find that these prefolds wash MUCH cleaner in the laundry than my synthetic fibre pocket diapers, and I end up with far fewer issues (like "funky" smells!) than with microfibre, etc. At only $19.95 for a pack of 6, these prefolds are all-around powerhouses. Next time I have a newborn baby, I will honestly be going with prefolds and covers rather than Frankensteining together my own system & collection. Once you get over the fear of folding & fastening, there is really nothing easier (especially in terms of care, laundry & maintenance) than this age-old system! 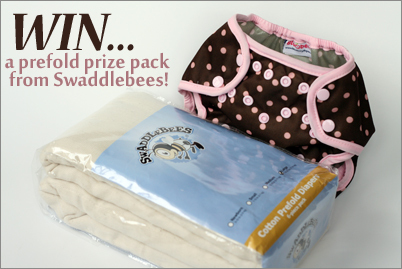 Head over to Swaddlebees right now and pick up a pack of these thirsty prefolds for yourself! Final details: I received no financial compensation for this review or giveaway, though I did receive the sample item free of charge. All opinions shared are my own, and I was not persuaded to share anything other than my own thoughts. Other users may have different experiences with this product than what I have shared. This giveaway will end on October 23, 2011 at 11:59pm MST and is open to residents of Canada and the USA only. Winner will be chosen randomly using random.org’s services. The winner will be contacted by email and will have 48 hours to reply before a new winner is chosen. The prize will be supplied and mailed out to the winner by the sponsor of this giveaway. I would LOVE to try the Blueberry One Size Bamboo Fitted! I would love to try a swaddleebees simplex 2.0 in the monkey print. So cute. I like swaddlebees on facebook. I have wanted to try a blueberry fitted diaper for a while now. 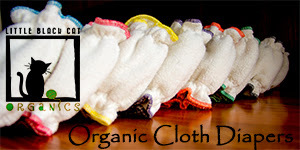 I "Like" Cloth Diaper Contests & Giveaways on Facebook! I'd like to try their econappi. I like Swaddlebees on FB. 'Liked' Swaddlebees on Facebook &left a quick comment on their wall! Shared the link on my Facebook HOT BABY DEALS page! I subscribe to your blog updates! I'd like to try the Simplex or Econappy! I'd love to try the Econappi. I'm a CDC&G email subscriber. i'd also love to get their diaper sprayer! I would love to try the Swaddlebees all-in-one diaper. Love the tweets print. I want to try their bamboo fitted! I need something better for nighttime. 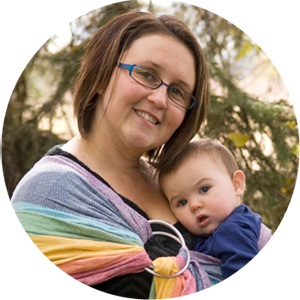 I would also love to have a Swaddlebees Econappi in the monkey print! I like Swaddlebees on FB, and I left a comment! I follow Swaddlebees on Twitter. I subscribe to the Swaddlebees newsletter. I would love to try a blueberry bamboo fitted. I also posted this on my giveaway roundup post that will be up at midnight, but I doubt I will rememeber to come back & leave the link, LOL. I'd like to try the blueberry one size fitted bamboo diaper. 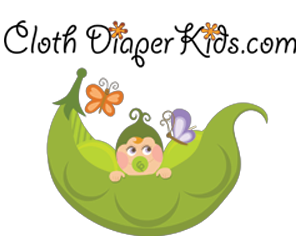 Like Swaddlebees on Facebook and commented on their wall (Sarah Jane). Follow CDContests on Twitter (@mummytocharis). Follow @swaddlebess on Twitter (@mummytocharis). 10/13 Voted on Picket the Fence. Your button's on my blog (mummytocharis.blogspot.com). Follow you on Networked blogs (Sarah Jane). I'd be interested in trying the Simplex. I liked Swaddlebees and left a comment. I follow @Swaddlebees on twitter. I also would like to have their Diaper Sprayer! I subscribe to Swaddlebees newsletter. I like you on facebook (under my married name). I liked CDC&G on FB. AAF of Swaddlebees on FB!